This is Paie’s unique “signature treatment” that synthesizes ancient healing wisdom with western healing modalities to smoothly resolve physical and emotional issues. Paie uses intuitive healing skills that have been honed over many years to help you uncover and identify an aspect of your life that needs to be re-aligned with your highest good and purpose. She then uses the Hawaiian practice of "ho oponopono" and NLP visualisation to heal this aspect at the sub-conscious level. Paie also incorporates reiki, massage, aura soma colour therapy and theta healing to help you connect to your spirit and open to the guidance of your higher self. The treatment will leave you with a clear connection to your own inner light and magnificence and you will leave with a renewed sense of clarity and purpose. 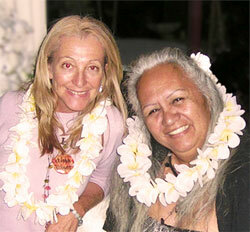 Below is a picture of Paie with her teacher Aunty Mahealani in Hawaii.